With the media spending so much attention the Knicks recently, it seems as if the Nets have been forgotten. But with a new arena coming in 2012 and rumors of Dwight Howard wanting to leave Orlando, the Nets certainly have a very bright future. With Deron Williams likely to re-sign with the team, the Nets are going to be major players in free agency during the next few years. Although they have a few bad contracts, the team still has plenty of cap flexibility. Combine that with an owner willing to do anything to win, and you could have a special team in Brooklyn in the near future. – Earlier today Deron Williams made news by apparently signing with a Turkish team. D-Will would obviously only play with this team if the lockout dragged onto into the NBA season, but it’s significant news nonetheless. – These types of moves are important because they put pressure on the owners to get a deal done. No one wants to see their star player get hurt playing overseas. – The Nets apparently prefer re-signing Kris Humphries rather than signing Nene. It’s hard to argue with that logic. Humphries will likely cost less and already has a year under Avery Johnson. Him and Brook Lopez are a very potent frontcourt duo. There’s no reason to break that up to bring in a guy who is more of a center than a power forward. – Speaking of the center position, there will be a battle for minutes there. Brook Lopez is obviously the starter, but who will get the remaining minutes? After a disappointing first season in New Jersey, Johan Petro is on the hot seat. The Nets probably won’t be able to move his contract, but it’s worth a shot. He only has two-years and a little more than $6 million left on his deal. It’s not exactly an albatross contract, but I believe Petro is one of the worst players in the league. The signing (along with the Outlaw’s ridiculous deal) continues to baffle me to this day. – With all of that said, Jordan Williams should be able to compete for backup minutes at center. He’s a rebounding machine that could serve as a solid role player for the Nets in the upcoming season. It’s not going to take much to be better than Petro. – As I mentioned before, Travis Outlaw’s contract is ridiculous. He’s not a terrible player, but he’s not worth anywhere near $7 million per year for the next four years. The Nets have to ship him to another team if they want to be able to make a huge impact in free agency the next few years. They’ll have enough money for Dwight Howard regardless, but Outlaw may prevent the Nets from adding another piece to the championship puzzle. – So where else do the Nets look for free agency help? I say the Nets should look to acquire quality players at the wing positions. Shooting guard and small forward are two major positions of concern for the Nets. Even with Marshon Brooks, the Nets don’t have enough firepower at two-guard. Billy King has to bring Sasha Vujacic back and then look for even another scorer. – As for the three, Travis Outlaw and Damion James just aren’t enough. Outlaw showed this year that he is simply a mediocre player who could fit in somewhere off the bench. He’s not a starter in this league. As for James, he can be a good player, but he’s proved nothing yet after an injury-filled 2010-2011. It’s great to have an all-star point guard, but there’s no point in having him if he has no one to pass to. The Nets have to explore improving every area of their team during this offseason. With the right pieces, this team could definitely make a push for the playoffs. For more on the Nets, the lockout, and the rest of the NBA., feel free to follow us on Twitter and Facebook. The new arena is coming, but there's a season for the Nets to play first. 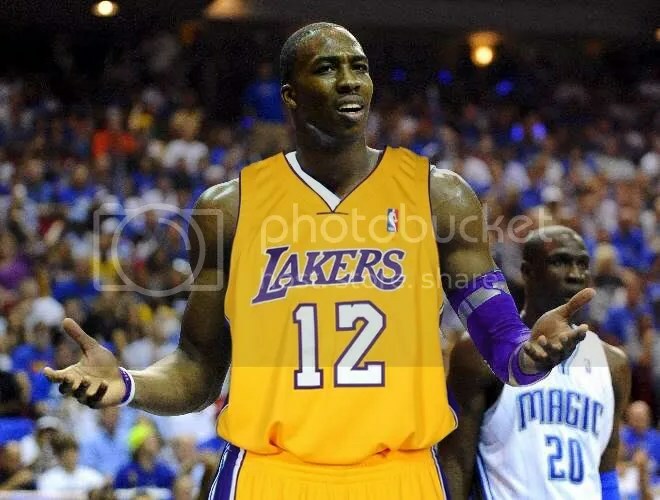 Dwight Howard Won’t Play for L.A.? We have a long time until we see any basketball again, but the Dwight Howard watch is still on. 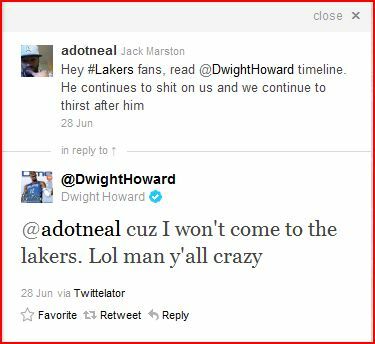 The speculation for months has been that Dwight either wants to go to the Lakers or Nets. While I wouldn’t get to excited yet, maybe we can begin to speculate that Howard doesn’t want to be a Laker. After digging through his Twitter account, we have found a rather odd tweet. In other news, ESPN claims the Nets are going to make a hard push for Dwight. The Nets, sources said, intend to make a hard push for Howard in an attempt to convince Williams to commit long term. It’s not time to get excited yet Nets fans, but there’s a good chance Superman will be a Net within the next two seasons. Follow us on Twitter and Facebook for more on Dwight Howard, the lockout, and possible landing spots for other players rumored to be on the move. The speculation has been for months that Dwight Howard would either be headed to Brooklyn or Los Angeles when he became a free agent. A trade has always been possible, even as early as this offseason. We are finally beginning to see the first true rumors of the Howard saga. Now I have to give Bob credit. He’s been wrong many times, but he’s often on top of things well before they happen. I don’t think Magic fans should cancel their season tickets yet, but I won’t discredit this rumor completely. Bob’s been right too many times, whether he really has sources or not. Even if this is just speculation by him, it’s worth listening to. After this, all hell broke loose. Other media outlets picked up the story, as well as Mike Carins, who actually said the deal could be done at 9 PM EST tonight. Dwight Howard to L.A. seemed imminent. A package centered around Odom and Bynum would be sent back to Orlando. Thankfully for Nets and Magic fans, all of these rumors seem to be false for now. I won’t call all of these rumors incorrect, as something could eventually happen. However, it looks like we’re in the clear, at least for today. Howard would be a great fit for the Lakers, but I think he’d be even better with the Nets. Maybe I’m biased as someone who watches a lot of Nets basketball, but him and D-Will would be one potent combo. He’d also be heading to a team with a fanbase who has never experienced a championship. He could help build the Brooklyn Nets into a truly global name. Could you imagine the hype surrounding him if he played in one of the five boroughs? The dream is alive another night for Nets fans. However, I would not at all be surprised if this trade does eventually go down. As much as Magic fans may hate it, it is probably the best thing for the franchise. It may or may not work out in the end, but it’s better than losing Dwight for nothing. Follow us on Twitter and Facebook to find out more about where Dwight might be heading. As soon as we know more, we’ll relay the information as quick as possible. Josh Smith is apparently on the trade market. The Hawks are curious to see what they could get in return for Smith. Smith said that he would prefer to play for the Celtics, Nets, Magic, or Rockets. Smith is a good friend of Dwight Howard’s so it would make sense for the Nets and Magic to show interest in acquiring Smith. For the Nets this off-season is all about acquiring players to put around Deron Williams. The Nets need to prove to Williams that they trying to put a winning product on the court. Acquiring a guy like Josh Smith would send a good signal to Deron. Smith is only 25 years old, and he has a great combination of offensive and defensive skills. Acquiring Smith may also give the Nets an edge in the Dwight Howard sweepstakes. If Howard and Smith are truly as great of friends as the above article makes them out to be, Howard may pressure the Magic to deal him to the Nets so he could play with Smith and Williams. Could Smith and Howard join Deron Williams in New Jersey and eventually in Brooklyn? Yeah, not what you were expecting. Don’t look into this too much, but realize that Howard to the Nets is a serious possibility. Along with the Knicks and Lakers, the Nets would present the best opportunity for Howard. Dwight would be the man in Brooklyn, something he wouldn’t have anywhere else. Deron Williams would be there, but Howard would be the main superstar. He could be what Jason Kidd was for the Nets in the 2000s. Also, the Nets would be pretty damn good with him. They’d have Humphries and Deron Williams, and could likely attract some valuable swingmen to fill out the roster. It’s going to be exciting to see the Nets good again. I have a feeling they may make the playoffs as soon as next season if they have a decent offseason, with or without Dwight Howard. But to take that next step, they’re going to need to get that second superstar. I have a feeling Howard may be that guy. I’ve said it all along, and I’ll say it again. Dwight Howard and Deron Williams would be a better duo than Stat and Melo. If the Knicks add a third star, they’ll obviously have a better core than the Nets. But if the Nets were to acquire Dwight tomorrow, they may just be better than the Knicks right now. I’ve always said if I were to start a team tomorrow and had to pick one player to be my franchise guy, it would be Dwight Howard. “D12” is a once-in-a-generation talent at center, which in my opinion is the NBA’s premium position. – Pierce, Allen, and Garnett are declining. I think Boston’s run is over. Miami/Chicago/New York will run the East for the next 5-10 years while the West will be wide open. The Nets getting Howard would change everything, which I think they very might well do. – Losing Perkins was huge. It was a really dumb trade. – Rondo is a great point guard, and the Celtics should still be good for a while. Just not title material. – LOL at “Heat fans” in the arena who have probably never watched basketball before. – LOL at Lebron crying after winning, as if he really accomplished something by winning a second round series. Didn’t these clowns crown themselves champions in July? – Chicago will beat Miami. They are much better suited to play them. Could the Knicks Acquire Kenyon Martin? On the day after justice was served on a much bigger scale, we now must move on and talk about justice in a different sense. After a rather mediocre 2010-2011 campaign, the Knicks must go back to the drawing board and make up for this lackluster season. Quite frankly, the fans deserved better than this after two years of tanking and a decade of losing. In a perfect world, the Knicks would get Chris Paul, Dwight Howard, Marc Gasol, Deron Williams, and every free agent their hearts desired. Unfortunately, you can’t re-build the Olympics team in the NBA. So the Knicks must pick and choose. One option according to LoHud is Kenyon Martin. Often lost amidst the incessant talk of Dwight Howard this, and Chris Paul that, is the fact that the Knicks’ most glaring need this off-season is for players that come cheaply, understand their respective roles, and complement the existing roster. And there isn’t much doubt that the player attribute that should be most sought after by GM Donnie Walsh is toughness. A presence on the defensive end, a respected veteran that can that can hit a big basket when necessary. Someone who is entirely comfortable being just a piece of the puzzle at this stage of their career. So might one of those pieces be Carmelo Anthony’s former teammate, and unrestricted free agent, Kenyon Martin? “At this point in my career, I think winning and being part of a winning team is more important than starting,” Martin said. Sure, Martin is no longer anywhere near the player he once was — and an argument can be made that he has always been overrated and under productive given his talent level (surprisingly just 13.5 PPG and 7.2 RPG for his career), but for 20-25 minutes a night, the Knicks could probably do worse. Yes, he’s injury prone, and yes, he was something of a bad apple earlier in his career, but Martin does bring elements of intensity and “not in my house-ed-ness” to the table that the Knicks could use. And although Martin’s never been mistaken for an all-world defender, he’s better than any other Knick “big,” he’s is an above average passer, and he shot over 50% from the floor last season in Denver. Much like how Bill Walker sometimes provided the 2010-11 team with an infusion of attitude, perhaps Martin can do the same. Martin has ties to area — having been drafted by New Jersey 11 season ago — and he’s never been bashful about shooting, a quality that fits right in with Mike D’Antoni’s coaching philosophy. As a bench player capable of scoring when Amar’e Stoudemire and Carmelo are getting a breather or find themselves in foul trouble, why not? Plus, he has lots and lots of tattoos. If he’s willing to play for peanuts, and he truly just wants to be part of a winner — along with some like minded other players — Martin just might make some sense. If Martin would take a one-year deal, I’d sign him in a heartbeat. He not only would be a very useful player, but he would be a valuable trade piece in a possible deadline deal for CP3 or Dwight Howard. Having watched Kenyon since his Nets days, I know what he’s capable of. Obviously a lot has changed since then, but I think Mike D’Antoni could find a role for him on this team. 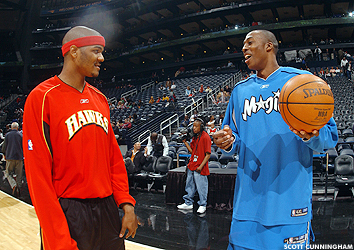 Could one of Melo's former teammates join him in New York?